Highmoon Hall is the residence of Idgrod Ravencrone, the Jarl of Hjaalmarch. * Though it is suggested that Falion is Morthal's new Court Wizard, he is simply an ordinary wizard trying to make a living within his shop. There is a guard standing to the right of the entrance at all times. There are snowberry bushes on either side of the stairs leading up to the entrance. To the right of the entrance is a lean-to with two chicken's nests holding chicken eggs under it. Further to the right is a nirnroot beside a pool of water and a few paces away is a patch of giant lichen and a blue mountain flower. Upon entering you are in the main room, where the Jarl holds court. 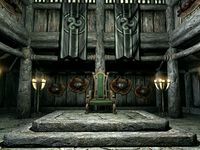 During the day the Jarl will be sat on their throne at the far end of the room, with their bodyguard stood beside them. On either side of the room there are wooden benches, stairs leading to two bedrooms and a door and doorway leading to two ground floor rooms. There is also a long fire pit in the middle of the room. The doorway to the southeast leads to the military advisor's room. There are a large number of mounted mudcrabs of plaques around the building. This room consists of six weapon racks holding an assortment of iron weapons on the northwest wall to the left of the doorway. There are many straw bales around the room. To the right of the weapon rack is a practice dummy. In the northern corner of the room is an unowned single bed beside a pile of firewood. Against the southeast wall is an unlocked chest with a wall shelf above holding two potions of minor healing, two potions of extra magicka a potion of enhanced stamina and a potion of minor stamina. Against the southwest wall is a long wooden table holding a map of Skyrim showing the progress of the civil war, the military advisor will spend a lot of their time studying this. To the right is a second unlocked chest, with a wall shelf above holding two loaves of bread, two minor healing potions and two potions of minor magicka. 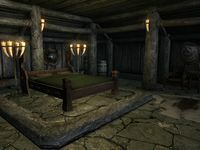 The sleeping quarters of the jarl. Opposite the doorway is the door leading to the Jarl's bedroom which consists of a large unowned double bed in the center of the room on a raised platform and three wardrobe to your left as you enter; two tall and one small. On top of the small one is a jug and goblets. To the right, still against the wall to the southwest is a large round wooden table and two chairs holding a bottle of wine, a bottle of alto wine and two goblets. Against the rear wall to the northwest are two long unlocked chests. In the northern corner of the room are two barrels of ingredients and two sacks of foodstuffs. In the eastern corner is a small round wooden table and chairs. On the table is a large coin purse, seven loose coins, two bottles of wine, a bottle of alto wine and a goblet. There is a wooden bench to the right of the door against the southeast wall. The stairs to the southeast lead to a balcony area and a door to Idgrod the Younger's bedroom. On the balcony is a small round wooden table and chair holding three bottles of Nord mead and at the other end a larger round wooden table and chair holding a mead barrel, two bottles of Nord mead and a bottle of alto wine. The Bedroom consists of an unowned single bed in the eastern corner, with a small wardrobe to the left holding a bunch of lavender. To the left of the door is a set of shelves holding three potions of minor healing, two potions of minor magicka, two potions of enhanced stamina, a draught of enhanced stamina, a bowl of frost salts, a bowl of glow dust, a giant's toe, three hagraven claws, a bunchg of frost mirriam, a bunch of jazbay grapes and a wooden bowl holding three chaurus eggs. To the right of the door is another set of shelves holding a goat cheese wheel, a goat cheese wedge two potatoes, two common books, four bottles of wine and two bottles of alto wine. Against the southwest wall is a dresser holding two loaves of bread. Above this is a wall shelf holding a bottle of Nord mead, a medium coin purse and three lockpicks. To the left in the corner is a food barrel with five loose coins and a large coin purse. 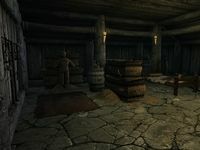 Against the southwest wall is a long unlocked chest with another wall shelf above holding three bottles of Nord mead. The stairs on the right lead to a matching balcony and bedroom, on the balcony are several barrels of food, one of them has four bottles of Nord mead on top and another a bottle of alto wine on. There is a wooden bench and small round wooden table and chairs. On the table are three more bottles of Nord mead, a bottle of wine and one of alto wine. The bedroom is Joric's and consists of a single unowned bed in the northern corner, a set of shelves opposite holding three cheese wheels, three lockpicks, a potion of minor healing, a potion of minor magicka, two red and three green apples and copies of Cats of Skyrim, Dwemer Inquiries Vol II, Horker Attacks, Nords of Skyrim, The Monomyth, Walking the world, Vol XI and the Lockpicking skill book The Locked Room. Against the southwest wall is a long unlocked chest, with a chair in front of it. On the southeast wall is a wall shelf holding a long taffy treat, two red and three green apples. The main hall of Highmoon Hall. 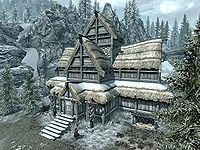 As you approach the door to Highmoon Hall for the first time, you may overhear a conversation between some of the residents of Morthal and Aslfur, one of the Jarl's advisors. The locals are concerned about ongoing trouble; further conversations will indicate some specific complaints: a house was lost in a fire, noises are heard from the surrounding swamp at night, and the presence of a mage in town—on top of the apparent hands-off approach of the Jarl. You may not be able to wait or sleep inside the hall at night, and if you try, you will receive notifications that you cannot do so when being told to leave, even though the hall is marked in the game files as a public area and nobody is telling you to leave. This may happen regardless of your disposition with the inhabitants. If the Stormcloaks take over Hjaalmarch, Pactur is supposed to move with Sorli and act as steward judging from his dialogue and faction. However, due to an oversight, she will only bring Teeba-Ei to Morthal, while Pactur stays in Stonehills. This is fixed by the Hearthfire add-on.